Florida weather can get hot and humid at any time of year. Because of this, you need your air conditioner to work efficiently every time you turn it on. If you are in need of fast and reliable air conditioning services, we can help. It doesn’t matter whether you need an emergency AC repair or a whole new system. We can be there on time and ready to serve. You need to be as comfortable with the people who work in your home or business as you are with the indoor temperatures. This is why we drug test and a background check every employee before we send them out into the field. Our AC technicians arrive at your place professionally groomed, on time and ready to get the job done. Our technicians bring many years of AC experience with them to every job. They are all EPA and NATE certified and experienced with a wide range of manufacturers and models. We know that your time is valuable. This is why we guarantee on-time appointments. There is no need to sit and wait for a repairman all day when you can have our techs show up right when they are expected. A new air conditioning unit can require a significant investment. However, sometimes it is the best choice to provide cool air in your home efficiently and affordably. While AC units are designed to serve for many years, they require eventual replacement like any other piece of equipment. A newer AC unit can provide a more comfortable temperature and even lower power bills every month. 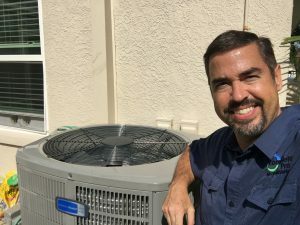 If an air conditioner replacement is the right choice, we can provide a free, no-obligation estimate so that you have the information you need to make the right decision for your budget and your home. Whether you need an emergency repair right away, regular AC maintenance or a new unit for your home or business, we are here to help. We provide on-time service to our clients in Riverview and throughout the Brandon area. Our 100% satisfaction guarantee means that we do the job right and are not happy until you are happy. There is no need to suffer in the Florida heat. We can provide the AC service that you need to get your AC running right and to make your home or business cool and comfortable. Call us for an appointment today.